Early August every year brings us the feast of the Transfiguration of the Lord, which was celebrated last Saturday. In reflecting on that scene over the last week, I’ve been thinking of it as the fulfillment of a foundational Christian desire and natural longing of the human heart. From the time of Moses onward, Scripture stresses the theme of people searching for the face of God. We see it particularly in the psalms: “Let Your face shine on us” (Ps 67:2), “Hide not Your face from me” (Ps 27:9), “When shall I go and behold the face of God?” (Ps 42:3). Our Holy Father, Pope Benedict XVI, has also embraced the theme, saying right on the back cover of Jesus of Nazareth: “This book is . . . my personal search ‘for the face of the Lord’” (Jesus of Nazareth, vol. 1, xxiii). Now, in between Moses and Pope Benedict came the Incarnation, which drastically changed our approach to satisfying this basic desire to see the face of God. In the Incarnation, Jesus took a human form, a human face. During His life on Earth, the Apostles had the opportunity to see His face every day for three years. Even more, though, the saintly triumvirate of Peter, James, and John are privileged to see not just the human face of Christ, but the face of Christ transfigured in glory. Imagine: what must it have been like to be on that mountain? What did it look like? How did it affect those chosen three? Did it satisfy their desire to see Him more fully? We don’t have the opportunity to see the face of Christ in the same way the Apostles did, so how can we satisfy our desire to see Him? I propose that, in order to see Him, we must listen; if we want to see, we have to hear. 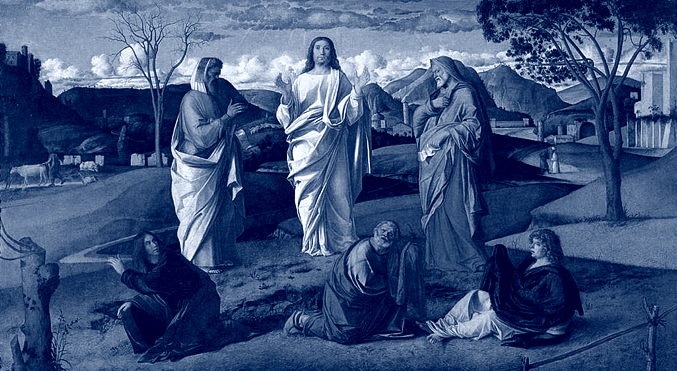 The Gospel says that the Father’s voice was heard at the Transfiguration, saying, “This is my beloved Son, in Whom I am well pleased; listen to Him” (Mk 9:7). Some Scripture scholars suggest that that one line—Listen to Him—is the climax of Mark’s entire Gospel. God the Father uttered almost exactly the same words at the Baptism of Jesus in the Jordan, which is another highpoint in his Gospel (Mk 1:11), and the entire narrative of Mark appears structurally to revolve around the scene of the Transfiguration. God the Father knows that we have to hear Jesus’ words before we can really see Who He is. It’s a mixture of the senses, much like the game “Marco Polo.” In that game, one person stands blindfolded in the middle and says, “Marco!” to which the others respond, “Polo!” Then, the blindfolded person tries to catch one of the others by following the sound of their voices. He has to hear their voices before he takes off his blindfold to see them. It’s the same with us: we need to hear the Word of God before we can see Him. It was the same for the people of Israel, who first heard the words of God through the prophets in the days of the Old Testament. Only later did they see Jesus in the Incarnation. Another example comes from St. Paul, who was blinded at his conversion. He heard the Father’s voice, “Saul, Saul, why do you persecute me?” (Acts 9:4, 22:7, & 26:14). Only thereafter did he regain his sight, and come to recognize Christ Jesus as His Lord. We find the same pattern also in the Holy Mass. The Liturgy of the Word comes before the Liturgy of the Eucharist, so we hear Him in the Scriptures before we see Him physically, substantially present on the altar. This is the model for how we can go about satisfying our desire to see God’s face. We can pray, spend time with Him, and listen to His voice in silence. By hearing His voice, His face comes into focus.